Convicted former legislator Vic Kohring has been denied his request to have the judge on his case removed. Kohring's attorney John Browne claimed that U.S. District Court Judge John Sedwick should never have presided over the trial because Kohring introduced legislation that cost Sedwick's wife her state job years ago. 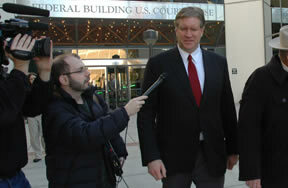 Kohring was convicted on November 1, 2007 of conspiracy, attempted extortion, and bribery. Kohring is still scheduled to be sentenced Monday. So far the massive FBI corruption investigation has snagged two of the state's three members of Congress, one of their aides the ex-president of the state Senate , four state legislators, a lobbyist, and two VECO executives. A fisheries investigation involving Senator Ted Stevens and his son Ben is expected to snag many high-profile fisheries executives and their cronies.